The Buffalo Bills lost to the Miami Dolphins last Sunday by a score of 21-17. It was a game the Bills came close to winning and it was a game the Bills should have won. The bottom line though is they lost the game and maybe that has something to do with there aren’t enough players on the Buffalo Roster who know how to win. 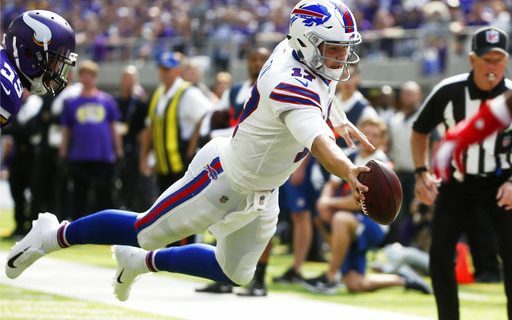 1) Josh Allen got off to a slow start but played a strong second half and was one play away from leading the Bills to a win. On the Bills final play, Allen scrambled in various directions before running to his left and then trying to throw a touchdown pass way to his right. The throw ended up being short but the effort was outstanding. Did he have time to set his feet before the throw? Probably, but in real time that is hard to criticize him. The most important thing is that Josh Allen is growing as an NFL quarterback and the more experience he gets the better he has gotten. He is making plays now that he never had a chance of making earlier in the season. 2) This Bills team is too undisciplined. Too many costly penalties and too many mistakes especially on special teams. The Bills had a punt partially blocked and then later a muffed punt that led to a Dolphin score. Special teams were also called for holding twice on a kickoff returns. As for penalties, the taunting penalty on Jordan Phillips I felt was a poor call. All three calls on rookie guard Wyatt Teller were costly. The interference call on linebacker Matt Milano I felt was a poor call but it still was a penalty that gave Miami great field position. 3) Speaking of the offensive line, their pass protection has to improve. In the fourth quarter they gave up two sacks that forced the Bills into attempting a long field goal that was missed. That missed field goal ending up forcing the Bills to go for a touchdown on their final drive. 4) Head Coach Sean McDermott made a poor decision when he felt that Miami quarterback Ryan Tannehill was tackled for a safety. Replay clearly showed the ball was not in the end zone when contact was made. In situations such as these, the Head Coach usually relies on the opinion of one of the coaches up in the coaches booth before he decides to challenge. Whoever recommended that McDermott challenge should lose that decision making job as it was a poor decision on his part. 5) Shady McCoy was once one of the top running backs in all the NFL. Those days are behind him, At this point of his career, he is no better than a good situational player. In the case of running backs, when they start to go downhill the process isn’t gradual but rather very quick. My feeling is if the Bills keep McCoy around another year he will be even less productive. It’s time to move on. 6) Zay Jones is beginning to become the wide receiver the Bills thought they were drafting in the second round of the 2017 NFL Draft. In recent weeks he has become much more consistent and he’s making plays at a much greater rate. That said, I doubt he will ever be a legitimate number one target but rather a solid two. The Bills will need to spend some money in free agency in order to sign a potential number one.